Day One of @CEIC_Conf started early. We had staff breakfast at 7:30 AM. Over breakfast, I was privileged to have a preview of David Shaver’s lab Following an Intrusion Through a Microsoft Operating System (Automated and Manual) – May 20th, 1:30 PM – 3:00 PM. Dave is a Special Agent for the SIGTARP and we served together in the US Army Criminal Investigation Command (CID). He is one of the foremost experts in digital investigations, and he will take you through an incident response with EnCase® and freeware tools. Afterward, I worked with Jason Fredrickson and Jamey Tubbs to install the EnCase Analytics server for Jason’s presentation Leveraging Endpoint Data to Solve Big Business Problems with EnCase Analytics, which took place today from 4:30 PM to 6:00 PM. As I left Jason’s session room, I found motivated attendees lined up before 9:00am, ready for Registration to open. After helping Jason, I assisted Josh Beckett, product manager for EnCase Cybersecurity, with creating a whitelist of all known good files on a machine in the Cybersecurity and Compliance lab. The whitelist is a matching files set containing the file name, MD5 hash value and file size. With this whitelist, Josh was able to create a System Profile in EnCase® Cybersecurity for the lab machines; and utilizing the System Profile and Analysis module, he will be able to quickly find any and all executables running or on the file system, which were introduced after the base build. Blacklists of known malware can also be added. This is a very powerful tool for locating unknown threats, including zero day malware. Each of the 77 lab machines has an EnCase Cybersecurity Examiner Service installed. When we ran the System Profile and Analysis job and a Snapshot job against all of the lab machines, it was exciting to see the Global database efficiently distribute the job tasks to each of the Examiner Services. This is true Enterprise scalability, as seen in the image below, with 137 individual tasks managed on the dozens of Examiners. You can join me for Josh’s lab tomorrow morning (May 20th), Cybersecurity 101 – 8:00 AM to 9:15 AM. Next, Aaron Bennett and I did a live walk through of our lab for tomorrow, How to Configure and Use SQL with EnCase Cybersecurity – May 20th 11:00 AM to 12:00 PM. Alex then passed the stage to Victor, who proclaimed Guidance Software is “Open for Business”. Victor shared how there is no single tool or solution to solve the many challenges in digital investigations. The good guys need to work together, through integration and interoperability. 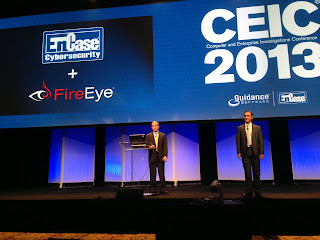 To prove his point, he shared the stage with Ashar Aziz, CTO and Founder of FireEye, who described the partnership and integration between EnCase Cybersecurity and FireEye wMPS. Fresh from Victor’s Keynote, I attended Jason’s Leveraging Endpoint Data to Solve Big Business Problems with EnCase Analytics for more details. Jason is the senior director of enterprise applications, and his team develops EnCase eDiscovery, EnCase Cybersecurity and EnCase Analytics. 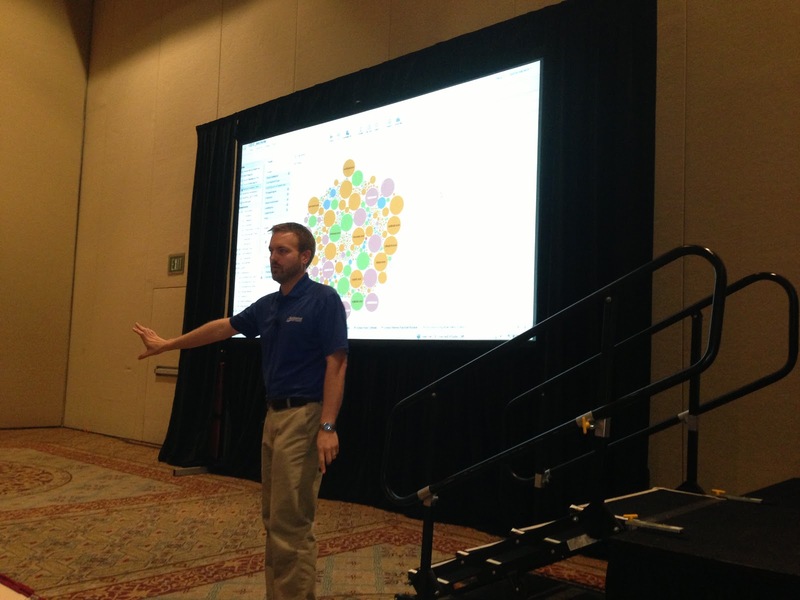 Along with Alfred Chung, EnCase Analytics product manager, Jason demonstrated how Guidance Software’s newest product will help you manage risk and compliance in your enterprise by aggregating all the endpoint data EnCase collects into a central location and presenting it in intuitive data visualizations. This summer, I will be creating an EnCase Analytics OnDemand training course, and there is no better source of information than the leader of the development team! The Welcoming Reception rounded out the official schedule for Sunday. Fresh pasta dishes were prepared on the spot, with great music and live entertainment. It was wonderful to see so many experts and practitioners in a single venue. The CEIC 2013 app is proving to be quite popular. I connected with friends and peers from around the Globe, even before their arrival today. “Checking In” to sessions, places and Exhibitor booths quickly became trendy and competitive; and I’ve been bumped down to 10th place on the leaderboard. 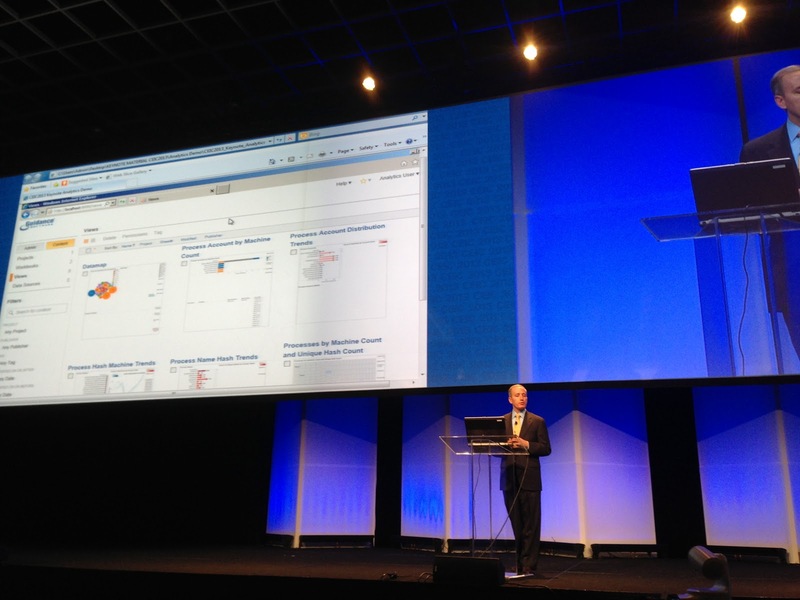 In addition to the App, there are several other new additions to CEIC, including the Buy EnCase Now kiosk. 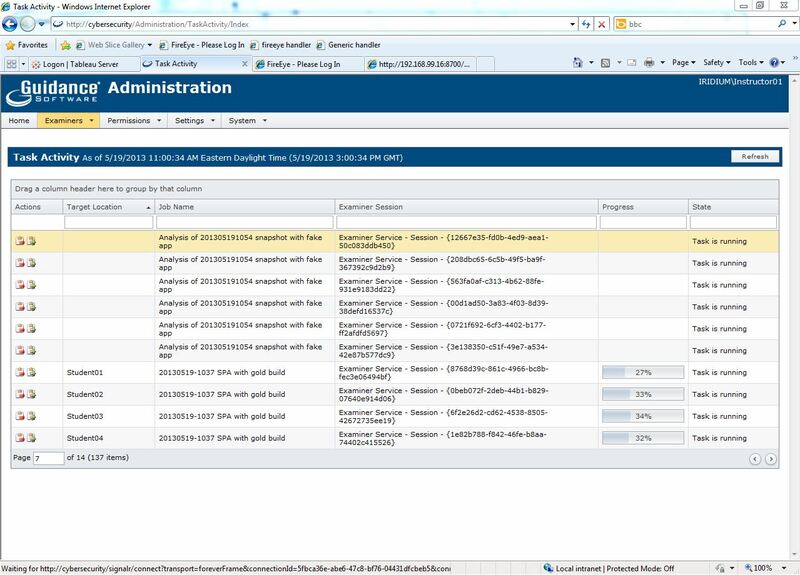 Customers have long asked for the ability to purchase EnCase at CEIC. If you stop by the kiosk before the end of the conference you will receive a free Tableau T35u USB 3.0 Bridge and EnCase Portable v4 & SMS for one year, with the purchase of EnCase Forensic v7 & SMS for one year. 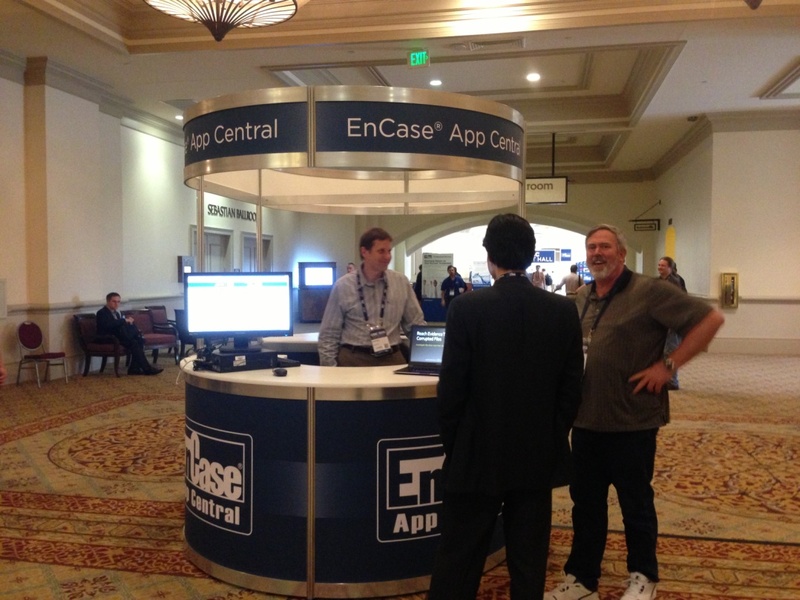 At CEIC 2012, EnCase App Central was announced. This year there is a kiosk for developers to demonstrate and sell their Apps. As the day winds down, I’m back in the Cybersecurity and Compliance lab, where Sam Yoon (solution consultant at FireEye), Joe Murin, Aaron Bennett, David Lyman and Josh Beckett are installing the FireEye wMPS appliance into the network, and integrating it with EnCase Cybersecurity for the lab Building an Integrated Response Capability with EnCase Cybersecurity – May 21st 1:30 PM to 3:00 PM. The Good Guys are working together!